Such technological advancements and the prospect that they will lead to the next green revolution have promoted a wave of startup activity in agriculture technology (agtech). Seeking to profit from this trend, venture capital (VC) firms have increased their investments in agtech at an annual rate of approximately 80% since 2012, with investments totaling $3 billion in 2015. (See Exhibit 1.) This surge in investments has occurred even as lower commodity prices have driven down net farm income to 65% of the peak reached in 2013. Even if only a small proportion of these investments produces successful technologies, the resulting wave of innovation could increase farm yields to an extent unmatched since the early days of mechanization. The startup activity and VC investments in agtech coincide with advancements in a wide variety of nonfarm technologies, including ubiquitous connectivity, data collection and processing, autonomous robots, rapid phenotyping, and gene editing. The use of these technologies has become increasingly cost effective, spurring their adoption by a growing number of farms. The scope and scale of these changes threaten to disrupt the markets and profit pools of mature agribusiness companies. To win in agtech, these companies must cut through the hype and develop a strategy that leverages their unique competitive advantages. The Boston Consulting Group partnered with AgFunder to better understand executives’ perspectives on agtech investments and capture insights to inform a potential path forward in this rapidly evolving area. How much are agribusiness companies and VC firms currently investing in agtech and how do they anticipate their levels of investment changing in the near term? Which technologies are these organizations prioritizing for investment? Which investment strategy (such as internal development, acquisition, or partnership) is being deployed by agribusiness companies and what challenges have they encountered? We surveyed more than 50 executives from leading agribusiness companies globally, which included most of the world's largest agribusiness companies. Respondents were primarily senior leaders—80% were C-suite executives, business unit leaders (such as presidents or general managers), or function leaders (such as heads of innovation or strategy). Companies in the sample were allocated roughly evenly among four agribusiness sectors: agricultural equipment, crop and animal-product processing, fertilizer and crop nutrients, as well as crop protection and seeds. We also surveyed investment professionals at 15 VC firms. The analysis of patent activity in the agtech area since 2010 was conducted by BCG’s Center of Excellence for Advanced Innovation Analytics using Thomson Innovation data. In 2015, the combined agtech investments of agribusiness companies and early-stage investments of VC firms totaled an estimated $20 billion to $25 billion. Most respondents expect investment levels in 2016 to match or exceed last year’s record. Three-quarters of executives cited a technology that fosters data-enabled agriculture as a top investment priority. Building big data and analytics capabilities is the key focus for these executives. Executives report that their company’s investment strategy is primarily defensive, evolutionary, and conducted in-house. Companies face a wide variety of obstacles to success, including a risk-averse culture, a lack of capabilities, and internal financial hurdles. The surge in agtech investment has brought the agriculture industry to the threshold of a new green revolution. The major sources of revenues are changing, and new profit pools are being created. To emerge as the winners in this shifting landscape, companies need to identify the most valuable technologies to pursue, given their capabilities. They must also think differently about their investment strategy and take a more rigorous approach to executing their selected strategy. To support companies in acting on these imperatives, we present data that helps executives understand the technologies that other players have prioritized. We also provide a framework that facilitates decision making on which technologies to invest in and how to win. For 2015, we estimate that agribusiness companies and VCs invested about $20 billion to $25 billion industry-wide, which represents 4% to 7% of their revenues, depending on agribusiness sector. Of the various agribusiness companies, those in the crop-protection and seed sector invest the highest percentage of revenues in agtech. Despite the continued decline in farm income, the vast majority (more than 80%) of agribusiness executives anticipate either maintaining or increasing their investment levels in 2016. VC firms are similarly bullish about investment growth. Where Are Investors Placing Their Bets? We asked respondents to tell us their top five priorities for investment among 27 technologies that fall within six agtech clusters: agricultural bioscience, data-enabled agriculture, automation and robotics, supply chain and logistics, agricultural processing, and alternative business models. (See Exhibit 2.) Of the 27 technologies, agribusiness executives have a clear focus on 7: big data and analytics, food security and traceability, biologics, optimization hardware, sensors and connectivity, new-crop technologies, and autonomous equipment. Although the investment priorities varied among agribusiness sectors, data-enabled agriculture stands out as a focus area for each sector and for VC firms. (See Exhibit 3.) Crop-protection and seed companies as well as VC firms are also heavily investing in their traditional focus area of agricultural bioscience. To present a perspective on the value creation opportunities in the emerging agtech landscape, we describe each cluster with respect to the applications, respondents’ specific investment priorities, and the agribusiness sector giving it the highest priority. To increase yields or reduce costs, farmers are using a wide variety of new bioscience technologies that optimize inputs to agricultural production. Examples include biologics (such as biopesticides or biostimulants), new chemicals (for crop protection), new crops, genetics, and seed technology. The emerging applications highlighted by our patent analysis include methods to enhance animal health, produce biostabilized organic fertilizers, and create plants with desired traits. Of our respondents, 60% cited a technology in this cluster as one of their top five priorities, with biologics cited most often. Crop-protection and seed companies have given the highest priority to this cluster. Greater access to and utilization of data at increasing levels of accuracy have allowed farmers to optimize inputs and costs. Data-enabled agriculture combines the application of sensors and connectivity, data storage and aggregation, optimization hardware, software platforms, and big data and analytics. We found specific groups of patents relating to plant data analytics, image processing, and crop monitoring, all of which are applications for data-enabled agriculture. Of the 27 technologies, those fostering data-enabled agriculture were cited as a top-five priority by 75% of respondents. Big data and analytics is the main focus for investments, with nearly half of the respondents citing it as a top-five priority. Agricultural equipment companies are the leading investors in this cluster, although companies in all sectors are making significant investments. Across sectors, agribusiness executives told us that investments in technologies that foster data-enabled agriculture are among their top priorities. To maximize the returns from these investments, executives need an in-depth understanding of their company’s competitive strengths along the value chain. The value chain for data-enabled agriculture has four steps—capturing, aggregating, and analyzing data, as well as prescribing actions on the basis of the insights—each of which must be taken on an IT platform that is accessible to all participants. (See the exhibit below.) 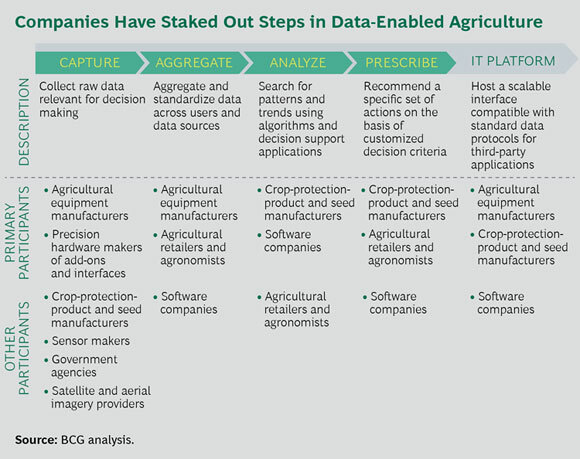 Industry players have staked out positions in specific steps of the value chain for farm-generated data, with no category of player taking a leadership role in all steps. For example, manufacturers of agricultural equipment are the leading players in collecting and aggregating raw data, whereas manufacturers of crop-protection products and seeds are the leaders in analyzing data and recommending actions. Both types of players are active in providing an IT platform. Agribusiness executives need to determine which steps of the value chain their company should participate in. Should they focus on opportunities related to their existing business or pursue opportunities in adjacent areas or across the entire value chain? Within each selected step, executives must also determine whether the company is best suited to be a leader, a follower, or an enabler of other participants. Traditional approaches to farming are being replaced by automated or robotic systems that eliminate manual work or enhance speed, consistency, and capacity. Examples include the use of electrified systems, autonomous equipment, drones, and robots. Among the emerging applications highlighted in our patent analysis are self-propelled harvesters and unloading systems, as well as robots used for weeding, harvesting, picking, and pruning. These technologies were cited as a top-five priority by 45% of respondents, with autonomous equipment cited most often. Agricultural equipment companies are the leading investors in this cluster. Agribusiness companies are using new technologies to optimize the movement of products from the field to the consumer or to improve their internal supply chains. Examples include technologies that optimize or enhance crop storage, packaging and shelf life, food security and traceability, and asset and fleet usage. The patent analysis indicates emerging applications that improve grain storage and make harvesting and transportation more efficient (such as conveyor systems and transfer stations). Supply chain and logistics technologies were a top-five priority for 40% of respondents. Technologies aimed at improving food security and traceability were cited most often as a priority. Crop and animal-product processing companies are investing the highest amounts in this cluster. New technologies for processing agricultural output (crops or livestock) are enabling enhanced or entirely new applications or allowing companies to optimize processing steps. Examples of these new technologies include biofuels, bioenergy, and biomaterials. Among the major areas of focus highlighted in the patent analysis are microbes that aid biochemical production, as well as applications related to biogas or marsh gas production and storage. Agricultural processing technologies, led by biofuels, were cited as a top-five priority by 35% of respondents. Crop and animal-product processing companies are also the leading investors in this cluster. New ways of doing business are emerging from the application of technologies. Agribusiness companies are deploying new business models (for example, technology- enabled sharing of equipment and farming as a service) and new production approaches (such as indoor city agriculture). Companies are also creating new markets (for example, alternative foods such as soylent) and new go-to-market approaches (for example, e-commerce). However, only 25% of respondents cited alternative business models among their top five priorities. Companies in other sectors are investing the most in this agtech cluster. Although agribusiness companies have made large investments in agtech, they have generally taken a cautious approach to investing. (See Exhibit 4.) Companies currently direct nearly two-thirds of their investments to in-house R&D, with smaller amounts invested externally through, for example, partnerships or licensing. More than 80% of respondents said that the primary intent of their investments is to defend or enhance their core businesses, rather than to create a new business. Their investment thesis is typically evolutionary: nearly 90% of respondents said investments are linked to an existing product or technology in the portfolio or targeted to achieving scale or strengthening an existing channel to market. Only 10% of investments are linked to building new capabilities. VC firms are taking a similarly cautious approach. Among investment professionals, 93% cited bringing a new technology to market as the primary or secondary rationale for their firm’s investments, and 40% cited building a new technology platform (to integrate multiple technologies) or improving existing products. Only 27% are seeking to disrupt existing players. None of the respondents selected developing a new business model. These firms expect that their investment exit strategy will most likely be through mergers with or sales to agribusiness companies or technology players. Respondents expect IPOs or buyouts by private equity firms to be their least likely exit strategy. Agribusiness executives recognize the need for an investment strategy that integrates external innovation into their internal R&D portfolio. When asked for their preferred way to invest in agtech, executives said that internal R&D would account for only about 40% of investments. Approximately half of investments would occur through partnerships and M&As—up from about 20% currently. Agribusiness executives believe that their unique competitive advantage in agtech stems from their ability to provide scale and a path to market for new technologies. However, these executives also report many obstacles to successfully investing in new technologies. When asked to identify their primary challenge, 36% cited a lack of internal capabilities or talent for scouting and developing technologies. As one respondent explained, “We lack the capabilities to find the right opportunities and capitalize on them.” Twenty-three percent cited internal financial metrics, reflecting the challenge of meeting profit objectives and hurdle rates. The same percentage cited the challenge of agreeing on investment priorities in a rapidly changing environment. A risk-averse company culture that impedes bold moves was cited by 18% of respondents. Recognizing that agtech is evolving rapidly, Monsanto is acting quickly and making big bets in order to get ahead of competitors. It is not waiting on the sidelines to see what happens. As Robert Fraley, the company’s chief technology officer, recently explained to AgFunder1, there is an “incredible amount of innovation that’s occurring across the biological, data science space” and this innovation will be important for farmers around the world. Monsanto has crystallized its focus. It is integrating data science with its core products business—which includes seeds, seed treatments, soil microbes, crop protection, and precision agriculture—to create a business that maximizes farmers’ production and profitability. The company has defined its strategy to capture the value of integrated solutions. It seeks to stay ahead of the curve through external-facing investments—more so than in the company’s previous corporate reinventions. M&As. Monsanto’s large bets on agtech include its approximately $930 million acquisition of The Climate Corporation, a digital agriculture company. It also acquired Solum, SupraSensor Enterprises, Yield Pop, and 640 Labs. Venture Investment. In 2011, the company launched a venture arm, Monsanto Growth Ventures (MGV), to invest in startups that have technology relevant to agriculture. MGV has made more than 12 investments jointly with more than 50 co-investors. The investments are spread across precision agriculture technologies (40%), biologics (30%), life science companies (20%), and new crops and new business models (10%). Partnerships. Monsanto focuses heavily on external relationships, both formal and informal, with universities, startups, and other large companies (including BASF, The Dow Chemical Company, and Novozymes). It has also recently embarked on building a series of strategic partnerships with data providers, such as sensor companies, to bolster its digital offerings through The Climate Corporation. Fraley expects the company’s external focus to be “even more aggressive” in the years ahead. “You don’t only need to worry about being disruptive but about your disruption being disrupted. I view that as a healthy paranoia to have as head of research for a company,” he says. Develop customer-centric technology solutions. Start by considering customers’ needs, not technologies. Identify the specific types of customers (with respect to region or crop) to serve. Determine these customers’ most important problems, how technologies can be used to solve them, and the value to customers of the proposed solutions. Build a technology roadmap. Identify the technologies that cut across the most important customer use cases and make significant investments in them. Ensure that the company’s technology roadmap is up to date. Determine where to create a differentiated offer. Have an “always on” scouting capability. Clarify who in the organization is responsible for scouting new investment opportunities. Agree on a regular process to evaluate opportunities with senior management on the basis of customer value. To monitor new developments, companies have used approaches such as establishing a technology center or field office in Silicon Valley or investing in a VC firm to gain access to a proprietary deal flow. Make a portfolio of bets. Make both evolutionary and revolutionary bets. Invest across a wide variety of mechanisms, including partnerships, licensing agreements, and direct equity investments. Ensure access to early-stage technologies. Take a “through cycle” approach. Understand where the company is in the business, commodity, and technology cycles and what opportunities are created by investor optimism or pessimism. Take advantage of bargains at the bottom of the cycles, even when cash is limited. Build capabilities that facilitate investing. Think of technology as a capability that cuts across the full organization, not a specialty outsourced to one group. To facilitate investments in agtech, the company may need to develop dedicated core processes, metrics, and incentives. What are our unique competitive advantages in agtech? Do we have the capabilities required to distinguish legitimate value creation opportunities from hype? How should we respond to our competitors’ investments in unproven technologies? When should we pursue acquisitions or partnerships instead of internal development? How do we make investing in agtech a systematic process rather than a series of discrete events? For many companies, the answers to these questions will point to the need to adopt a more rigorous approach. The resulting improvements will not only help to drive higher returns but also position the company to play a leading role in revolutionizing how farming is practiced for decades to come. The authors are grateful to Rachel Lee and colleagues at BCG’s Center of Excellence for Advanced Innovation Analytics for their contributions to the research and analysis underlying this report. They also thank Justin Rose and Robert Vrancken for their insights and thought partnership. Additionally, the authors would like to thank David Klein for his writing assistance and Katherine Andrews, Gary Callahan, Kim Friedman, Abby Garland, Trudy Neuhaus, Sharon Slodki, and Sara Strassenreiter for their contributions to the editing, design, and production.